Yes, Wolves Killed 19 Elk. But What Does It Mean? The killing of 19 elk by wolves on a Wyoming feedground should be another wake up call: if elk managers are going to treat elk like livestock, then managers must protect elk like livestock. Feedgrounds are unnatural and similar to what the livestock industry calls a feedlot. Winter-hungry elk are drawn by hay handouts. An abnormally large number of elk cram into a relatively small area. Crowding breeds diseases that create vulnerable elk that attract wolves that kill one or two a night. Wolves rarely kill more than they can quickly eat, so called surplus killing. Wyoming has 22 feedgrounds plus the National Elk Refuge. Bruce Smith, worked as the National Elk Refuge biologist for 22 years. In his 2012 book, WHERE ELK ROAM, he reports only two instances of surplus killing by wolves at the refuge. He concludes, "...these two cases proved to be exceptions to the wolves' hunting tactics." Mike Jimenez, the Northern Rocky Mountain Wolf Coordinator for the USFWS, came to a similar conclusion: "We did an eight year study and we looked at elk feedgrounds. What we found is that generally wolves did not kill what they did not eat." He said wolves do not kill for sport. Why does surplus killing occur? In the book WOLVES: BEHAVIOR, ECOLOGY, AND CONSERVATION, David Mech and Rolf Peterson state that when wolves engage in surplus killing, "...they respond normally to a situation that is drastically different than usual-prey are highly vulnerable, rather than being especially hard to catch." This certainly describes a feedground crowded with elk, some sick. The biologists say it's reasonable to assume that wolves would return to surplus kill when prey is harder to obtain elsewhere. A Mech study supports this. "In Denali National Park, six wolves killed at least seventeen caribou about 7 February 1991, and of course could not eat them all. By 12 February, however, 30-95% of each carcass had been eaten or cached; by 16 April, wolves had dug up several of the carcasses and fed on them again." Doug Smith, project leader for Yellowstone's Wolf Restoration Project, described in an NPS video what looked like surplus killing. In March of 1996 a Yellowstone pack killed five elk in one day. "And they cycled back and ate everything on those five elk over a two-week period." No surplus. Unfortunately, wolves will not be able to return to the elk on the feedground. The carcasses have been handled by humans, dragged into a picturesque line for the media. So if research shows that feedgrounds are ripe for surplus killing, and history shows such killing occurs, why don't feedground managers do more to deter it? What strikes me is the response to kill wolves as the first resort. Why didn't WGFD say that this makes a strong case for using nonlethal deterrents? Range riders, guard dogs, noisemakers, and other deterrents keep wolves and livestock separate and alive. 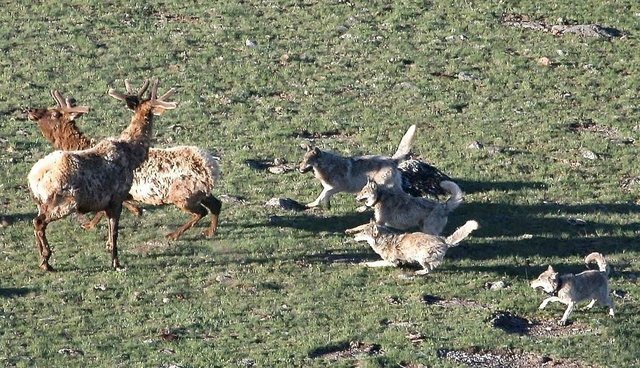 Feedground managers that treat elk like livestock should study Idaho's Wood River Wolf Project, which proves that nonlethal deterrents protect sheep-livestock even more susceptible to surplus killing. Feedground officials may say they don't have the money to implement nonlethal deterrents. But, revenue to help cover the cost could come from adding a fee to elk hunting licenses. That is, after all, one of the main reasons why feedgrounds exist. Wolves should not be killed because of a problem created by treating elk like livestock.